Microsoft said it would be releasing a dedicated Xbox Music app on iOS and Android when it launched the service almost a year ago, so we’ve had quite a wait, but it’s finally over today as both have landed in their respective app stores. Xbox Music is Microsoft’s rival to Spotify, iTunes, Pandora, and other streaming music sites, and boasts a catalog of at least 30 million songs. Both applications are free to download, but you’re going to have to cough up if you want to use them. Microsoft will sell you its standard Music Pass for $10 per month, or if you want to pay for a year up front, you’ll get the slightly discounted rate of $100. If you’re not keen on paying without giving Xbox Music a try, Microsoft has made the web-based service free to use, so you can test drive it there. If you enjoy it enough to pay for a subscription, the Xbox Music Pass is also good for use on the Xbox games console, and on your Windows 8 tablet or computer. Subscribe and you’ll no longer hear any ads on the new, free online version either. You can download the iOS app from iTunes now, where you can stream music, create playlists, and listen to curated artist-based radio stations. 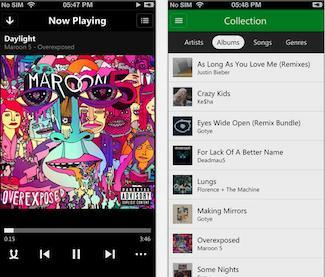 Songs added as favorites on your PC or console will be synced across to your mobile phone, and vice versa. Grab the Android app from Google Play here, but beware, this first version has limited compatibility. It may say it’ll work with Android 4.0 and above, but it’s incompatible with the Galaxy S4, Galaxy S4, Sony Xperia T, and several others. According to one review, it’s fine on the Galaxy Note 2 though. Initially, the iOS and Android apps will need a data connection to operate, but in a future version of the app, offline playback will be added.